Ever wonder why dolls affect body image? The pressure to live up to a certain ideal of beauty and body proportions, promoted by popular media and culture, starts at a very young age. The most alarming statistic is the one that shows that by the time girls reach the third grade, 42% of them wish they were thinner. A very popular doll, that is owned by almost every American girl between the ages of 3 and 11 (and often times more than one doll at a time), is famous for its exaggerated body proportions, which are so far from reality that only 1 in 100,000 women would actually have those same proportions (according to popular author Kevin Norton). There are other studies, such as that conducted by the University of Sussex in 2006, which found that such dolls “may damage girls’ body image, which would contribute to an increased risk of disordered eating and weight cycle.” Since these are dolls that children start playing with (or are gifted with) from a very early age, you could say that the negative programming begins from the age they start playing with the doll. If the above is true, then conversely, if children are given toys such as dolls that reflect a healthy and realistic body image, it would help them be more loving and accepting of their own bodies, isn’t it? Are there any alternatives to the popular dolls that are made in the likeness of a real woman? Before we go into that, let’s look at the top five reasons how and why dolls can affect a child’s body image. Popular dolls give children a very skewed and unrealistic perception of what a woman’s body should look like. For example, the weight of an average American woman is 166 lbs. and her height would be 5”4’. The average woman’s body measurements are 41-34-43, while the popular doll’s body measurements (if it were converted to that of a real woman) would be 38-18-34! When the dolls arms are spindly thin and the feet are in a permanently pointed pose, with abs that look flat and flawless and thighs that look slender and perfect, children are getting a very unrealistic image of what it is like to be an adult woman. Eating disorders are becoming an epidemic in America today, with 1 in 10 high school students having it. When 90% of the 70 million people suffering from bulimia and anorexia (on a worldwide basis) are women aged 12 to 25, you know that there is something seriously wrong in the culture that surrounds them. What would make these women want to pursue the perfect figure to the exclusion of everything else, even their own health? You could limit the TV shows or magazines that your child watches, but when these images are everywhere, on billboards and poster and banners and magazine covers on newsstands, how far can you shield your child from it? There is one thing you have control over, however, and that is the toys and dolls that your child plays with. Perhaps having a doll that shows what it looks like to be have a healthy, average, normal body from a very young age could have changed the course of these young girls’ lives? Popular dolls cause an erosion in self-esteem stemming from insecurity. When young children play with these dolls, they get caught up in the world of make-believe that comes as part of a huge marketing campaign with these dolls. From doll houses to fashion and accessories, all of these only lead to a feeling of inadequacy in children. They also feel a constant sense of having to match up to what their friends have in terms of the clothing and accessories that their dolls have. This creates an unhealthy competition and feeling of “not having enough” from a very early age. However, having dolls that wear clothes and accessories that are approachable and affordable removes this feeling of inadequacy in children. Popular dolls are well known for creating a materialistic mindset in children, what with their whole array of model beach houses, salons, doll houses, country houses, etc., that may be out of reach for the average child. Having a doll that promotes a lifestyle that is more practical and realistic will go a long way towards showing children what is important and what is not. Studies done by the University of California showed that playing with these popular dolls severely limited the imagination of young girls as to what they could achieve in their lives. 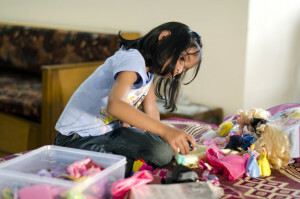 Toys can influence how a child thinks about their future and the roles they can play. Having dolls that give a wide berth to a child’s imagination can positively impact their future. What are the alternatives to these popular dolls? Lammily has her own branded line of clothes and accessories that make her look like any well-dressed young girl out there. The Lammily Marks sticker sheet is a brilliantly designed set of stickers that look like acne, bruises, cuts, mosquito bites, and stretch marks. These help young children make her look even more like themselves or like someone they know. They help them understand that flaws are an integral part of the human body. You can be born with them or they can happen to you as you grow, but it doesn’t make you any less lovable. The adventures that Lammily goes on are numerous and ideas to make these adventures come true are available on the website. You can learn to make a wheelchair, an oxygen tank, a zipline, a flight suit, etc., to let your child give Lammily any experience of her liking. With the Lammily doll, there is no limit to your child’s imagination, both for the present and for the future! Gifting a Lammily doll would be giving your child the key into the world of self-love and self-acceptance. This entry was posted in Lammily Doll and tagged Body Image, doll, Girls, lammily, Toys.